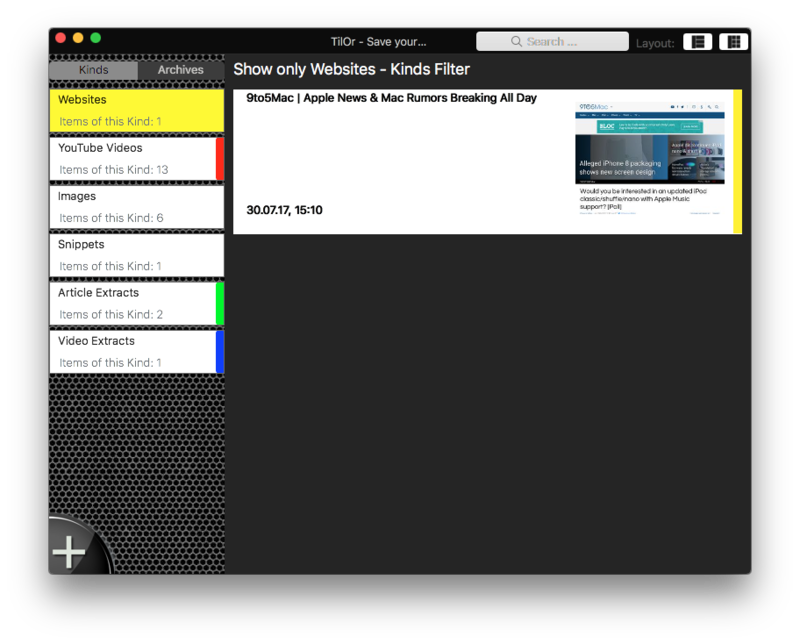 TilOr Des is the MacOS Equivalent of TilOr on iOS Devices to store, organise and fast access your Media and Web Content you either want to remember or revisit very often. The Internet is awesome, but its alls very short living for various Content, Articles go into Archives and out of sight, Images become unreachable or you stored something, but cannot remember, where or what it was, a visual help would be great, and that's what TilOr Desk does. You can add, filter, search and group Items into Archives for easy structuring. To prevent Images become unavailable once you want to review them, TilOr Desk makes a hard copy of any Image you add to keep it as long you desire. TilOrDesk provides very easy way to save Items from anywhere on your Machine. It provides a Drop area sitting silently at the top edge of your Screen, you simply drag something against the top of your Screen and TilOrDesk will proceed, once don, one click more to confirm or specify your desired Action and it’s done! Added Items are in your Inbox, you can leave them there if you want to evaluate this Content later, or click on it to Show or in best case Archive it into an Archive you already created to store it for later. Websites: Dropping an URL to a Web Page creates a visual Bookmark, similar to the one you know from any Browser, but in addition, you get a Preview Image of this Page for easier and fast refocusing your search for later. YouTube Videos: This type takes the YouTube Video ID and extracts just the Video and built a Player right into TilOr, from here you can play a Video inline of TilOr UI or view it with the built in Player for Full Screen, fast forward or PiP. Image Tiles store the whole Image into your Database, so even if an Image is gone tomorrow, you will have a copy of it as long you want, you can simply double click the preview to zoom out or even save it as a copy to your Harddrive. You can edit Titles for each Image as well. Snippets a partial text parts on any Website, Document or anything else that allows you to highlight text and copy it to Clipboard, TilOr also attempts to keep Layout and look and feel of text, so bolded text shall stay bolded instead of putting it int plaintext , the same is for layout and structure. TilOr Desk provides a system wide Service to quickly add a Text Portion to TilOr, simply select some text, right-click,, goto Services and choose "Save as Snippet in TilOr Desk", thats all! Extract Areale or Video are nearly same logs as Youtube Vidoe, you keep just the part that matters instead of loading the whole Website. Regarding Video Extract: Best results are made with YouTube, Video or Dailymotion embedded Videos, custom Player are rarely successful, because they attempt to hide their source material, also regarding Youtube, please keep in mind, TilOr aceesss only allowed content, so if you see a Music Video provided by Vevo e.g., this won’t work due to Content Restrictions by YouTube. Sync is also available, it relies on iCloud, but works different than other Apps. 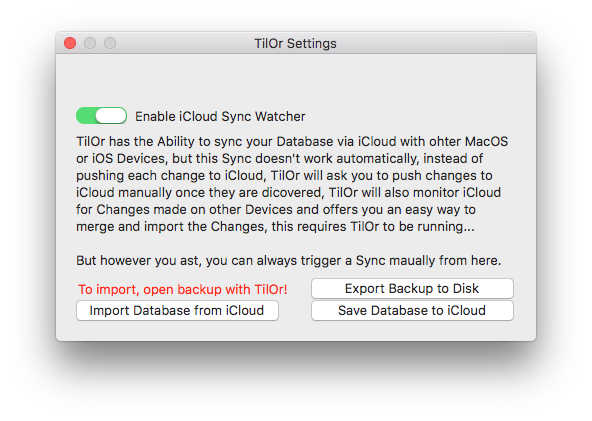 If enabled, TilOrDesk will watch your iCloud Database for changes, once they are discovered, it ask you if you want to update or not. The sync is a manual and only on demand sync. So instead of syncing everything you add, remove or edit, TilOrDesk will offer you a quick 1-click Sync option, but you don't need to, if you store stuff here just temporarily, you don’t want to sync everything to any device. This decision was made due personal usage scenarios, i often drop stuff here like Article or Videos to watch or read later and don't want TilOrDesk to sync everything across all Devices even if it just for 20 minutes of Storage. You can also trigger a Sync or Backup from the Settings Window.